In this tender personal narrative, Karyn provides a much-needed insight into the painful journey of losing a child. Travel with her as she processes through the reality of her painful loss and the redemption of love. 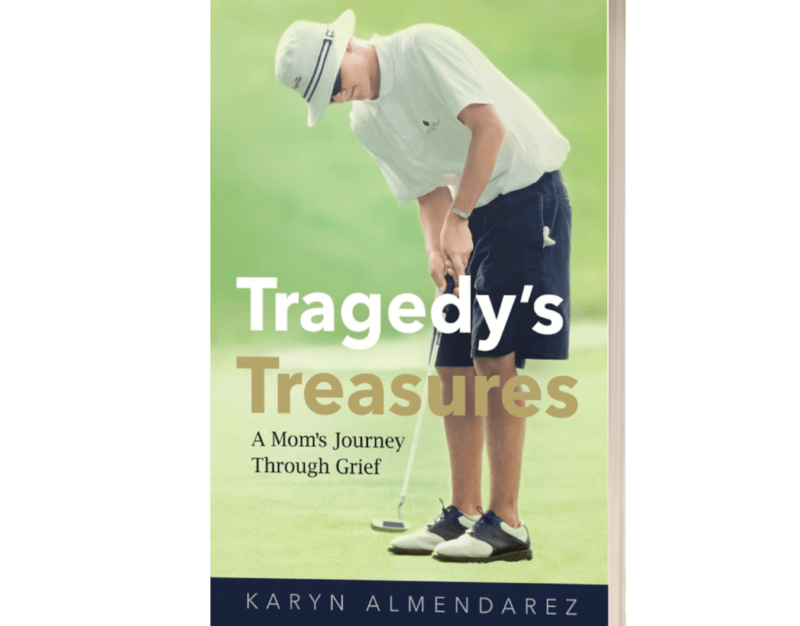 Tragedy’s Treasures, A Mom’s Journey Through Grief is an open window into the heart and soul of the life-changing events that took a mom’s sixteen-year-old son’s life in an early morning car accident. *Could I Have Prevented It? *What Am I Supposed To Do Now? And the death of a child, no matter their age, leaves the parents, siblings, grandparents, relatives, and friends feeling shattered and powerless. Just finished reading Tragedy’s Treasures and have such an amazing sense of calmness. What a beautifully written story about not just grief but the treasures we can find if we open our hearts to God and are willing to “hear” them. Karyn, you have written a beautiful book that I intend to read again and again as well as give to those close and far. Your words alone are a treasure for the reader. This book opens up so many possibilities for those that have lost a loved one and are looking for some encouragement to keep going. Thank you so much for sharing your story! 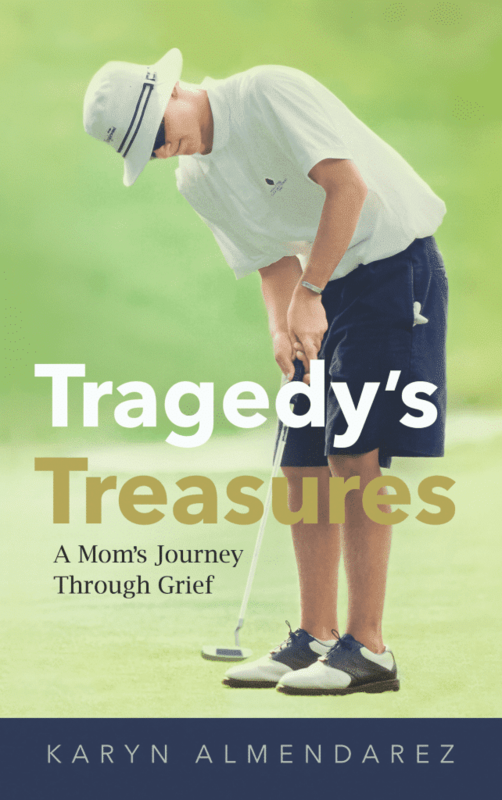 Tragedy’s Treasures is a mother’s journey through grief over the loss of her son, Bart. The author bares her soul as she describes her loss and how she dealt with it. The author exhibits incredible strength, courage, and faith after her son’s death. She is an inspiration to all who read this book. I felt her pain and cried as I read it. The author shares her faith in God and passages from the bible that aided her in handling her grief. A wonderful book that will move all to tears. We learn early on in her book that her son, Bart, died at 16-yrs-old in a tragic accident (although she later reflects “There Are No Accidents”). Yet she takes her time, seemingly preparing us, circling back to help us understand her life, Bart’s life, who they were at that moment in time, before sharing the full impact of a young life taken and lives changed forever. It is evident that her Christian faith and beliefs greatly influence her journey through her grief, her ability to find acceptance in what is, to feel the ultimate agony, and yet be vulnerable, and continue to be open to life. Her story inspires trust that experiencing excruciating pain and a good life are not mutually exclusive, that indeed there may be treasures in our tragedies. Yet her story is not Pollyanna…it is real, and at times raw; her words are succinct and poignant, and in no way gratuitous. The book is not a “playbook” for getting through grief. It is one woman’s story told after considerable reflection, sharing her heart and soul…and I believe it is indeed our stories that inspire and can bring hope and healing. Don't miss a blog post! Get monthly updates and encouragement for healthier living. Also get access to FREE RESOURCE LIBRARY! Way to go! Expect an email shortly.